Although most of the flute sonatas by Johann Sebastian Bach pose questions of authenticity, the B-minor sonata BWV 1030 is undoubtedly his own work. There is even a manuscript with his own signature, which leaves little room for doubt. 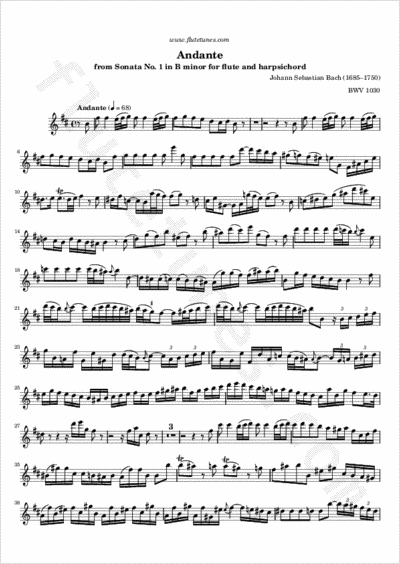 This flute sonata is one of two (the other being BWV 1032) in which the harpsichord part is fully composed. This differs from the past style of continuo, which left the keyboard player plenty of room for his/her own ornamentation. Given this, the harpsichordist acts as an equal partner to the solo flute and shares the melodic material. The first movement of the sonata, marked “Andante”, is the most distinctive. Its free ritornello (an Italian term indicating a short recurring passage) form encourages stimulating interplay between the flute and harpsichord. Find here the other two movements of the sonata: Largo e dolce, Presto.